This old doll is an unusual shape and design. 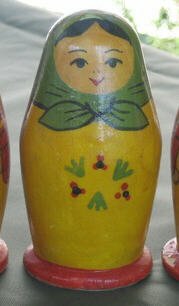 The solid doll was part of a trio of similar dolls. The doll is natural wood that has yellowed and darkened with age. She has black hair and dainty smile and wears an olive green babushka. She has full red sleeves and dot flowers on her dress. The base of this doll is very thin and flat. There is some paint chipping with age on the top of her head.